The stats files: Will a six-day break hurt Pies, GWS? STATISTICS suggest the war of words between Collingwood president Eddie McGuire and the AFL over the looming six-day break for the preliminary final might be for nothing. The winner of Saturday night's Magpies-Giants semi-final will have that quick turnaround to face reigning premier Richmond for a Grand Final spot the next week. The Tigers, of course, booked their preliminary final berth last Thursday night and have this weekend off before resuming their tilt at back-to-back flags on a 15-day rest. One of Collingwood or Greater Western Sydney will become just the third team in 19 years to enter a preliminary final on a six-day break, with a win and a loss for the two previous combatants. But is it really the daunting task it's being made out to be? The scenario where a team off a six-day break plays an opponent with a 10-plus-day hiatus has occurred 51 times in the past decade. The six-day break side won 31 of those contests and lost 20 with a percentage of 106. There were eight such instances this year, and the team with the shorter turnaround claimed five of the matches. The Magpies are unbeaten in five games with a six-day break in 2018, while the Giants won five of six matches – including their two-point round 17 upset of Richmond – in that situation. Another factor is that every club had a week off between the end of the home and away season and the start of the finals. The numbers also suggest it is still at least a 50-50 chance in that circumstance for the team playing six days after their previous match. Now comes the bad news for Collingwood and GWS fans, and possibly one of the reasons for McGuire's angst. 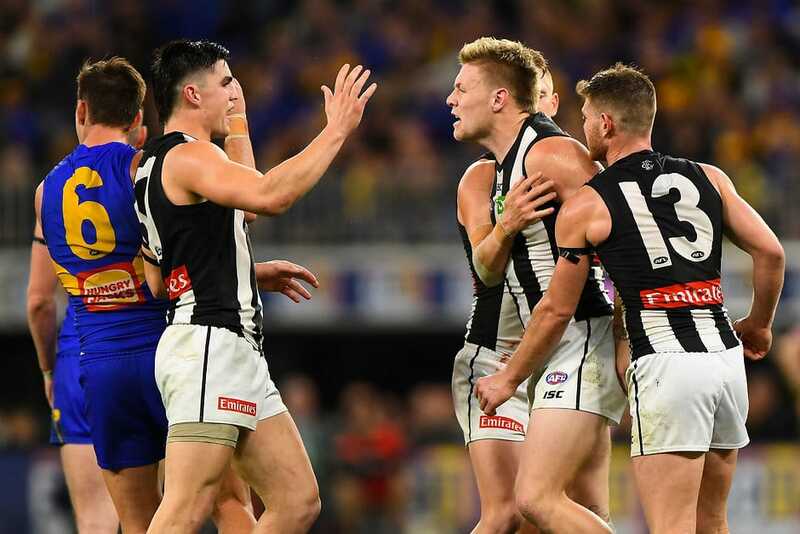 The Giants have never experienced a six-day break in the finals, but the Magpies have won just once from four post-season attempts with that turnaround in the past 10 seasons. In fact, only 11 finalists won from 31 tries in the same period. McGuire blasted the AFL's scheduling on his Triple M breakfast program on Monday, saying the League's fixture-makers "cocked this up". The Collingwood powerbroker wants the two preliminary final timeslots swapped to give everyone a seven-day respite. "It's just wrong. You guys have got this one wrong … (but) you've got two weeks to change it," McGuire said. "Why don't you have another meeting this morning and have another look. It won't happen? Why, because the fixture's been so good all year? "How about we fix the fixture for the finals and make it even for everyone to have a go at winning the flag." The AFL's fixture manager Travis Auld said the preliminary final schedule would not change and that League officials had prioritised the Tigers as minor premiers. Did you notice a visible increase in pressure in the opening week of the finals? You were right, and it's a typical trend at this time of the year, with the best teams' defensive prowess coming to the fore. Friday night's Melbourne-Geelong clash was more pressure-packed than the rest of the week's finals, with their combined game factor of 198 the 16th-highest for the season. The pressure point stars were Hawks Liam Shiels (78.2) and James Worpel (65.7), Demon Alex Neal-Bullen (70.2), Cat Joel Selwood (68.4), and Eagles Luke Shuey (65.5) and Willie Rioli (65.4). All the winning finalists in week one spent more time in front during the home and away season than their opponent. As a reminder, Richmond beat Hawthorn by 31 points, Melbourne defeated Geelong by 29, Greater Western Sydney thrashed Sydney by 49, and West Coast overran Collingwood by 16. Geelong captain Joel Selwood wasn't the only Cat with disciplinary issues on Friday night against Melbourne. Brownlow medallist Patrick Dangerfield conceded a whopping six free kicks, including two each for holding and pushes in the back, to almost put him in the top 10 in the AFL for indiscretions. The superstar midfielder ended the home and away season with the 35th-most free kicks against and is now 11th, although it must be pointed out that his 56 free kicks place him third. Carlton's Patrick Cripps (68) has received more free kicks than any player in 2018, while Tiger ruckman Toby Nankervis (57) has given away the most.